What Does The AT&T Software Update Consist Of? Thread: What Does The AT&T Software Update Consist Of? 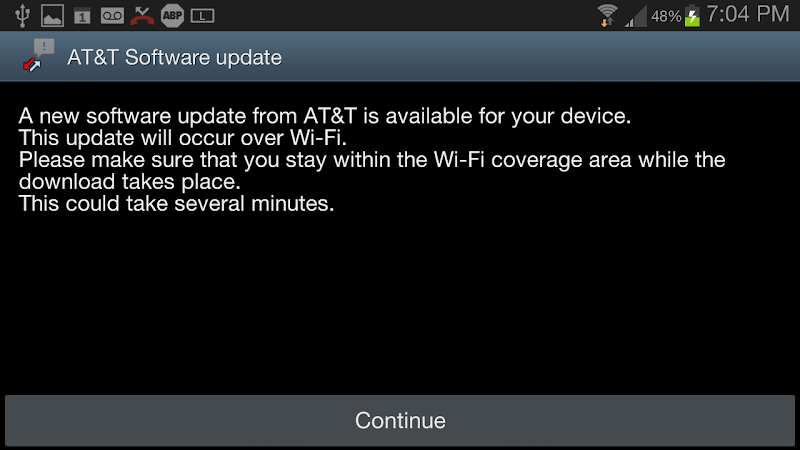 What Does The AT&T Software Update For Android 4.1.2 Consist Of? I've been receiving the following message notification on my trusty T.E.D.5 (aka Galaxy Note 2 Phablet) and wanted to post a question here in the forum to see if any one knows the content of this update "before" accepting it (especially rom att. All I need is more uninstallable bloat). Then I was "dagg-nabbited" if the update started downloading until I turned off my Wi-Fi that stopped the download. Anyone else receive an upate on your Note 2 and/or know what this update is? Last edited by Rico ANDROID; 03-18-2013 at 07:43 PM. Disregard this string. I was curious if AT&T bloated the 4.1.2 update and which would have prompted me into a rooting mode after updating so to remove or disable the extra stuff. Just got another ATT update pushed onto my trusty android GN4... I see bloat added and it ate more internal memory....rats...i wanna ROOOOOOOT! Yes but this should be 5.1.1 which is a GOOD update. Should see better battery and a little snappier performance. Thanks @Miller6386. I havent had a chance to review online whats included in 5.1.1 but its good to hear that this should be a GOOD update. Will check it out more over the weekend! Hey please let me know if i should move this question to another thread. I got an AT&T android system update 6.01last week pushed to my trusty GN4. Now when i am on a call the green screen shows a half face image and all select options dont display like the bottom half of tue screen is chopped. i use landscape view because i need to see as much as possible horizontally. is there anyone else getting this screen and any suggestions?